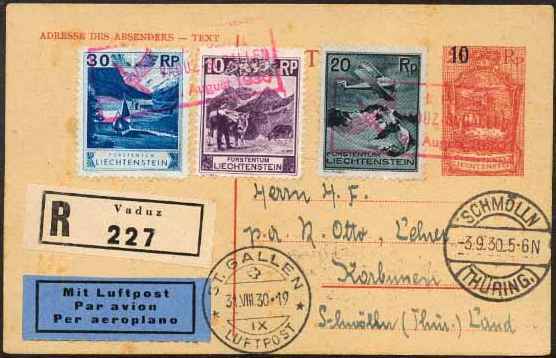 This registered postal card was carried on the first flight from Vaduz to St. Gallen in Switzerland. Switzerland and Austria (and between Libya and Lithuania in the catalog). 1. Postflug | Vaduz-St. Gallen | 31 August 1930. There is a trilingual airmail etiquette. Registration was noted with a preprinted label. St. Gallen is east of Zurich less than 10 km southwest of Lake Constance (Bodensee). The flight covered less than 40 km! The arrival in St. Gallen was marked with an August 31st CDS. The postal card was then forwarded to its destination of Schmölln in Thüringen. Schmölln is about 50 km south of Leipzig west of Chemnitz. It arrived there on September 3. There is nothing on the back of this card. The postal card was originally 25 rappen but surcharged 10 rappen. the 10 rappen dark violet Rafenberg Chapel (Scott 99 and 96). an airplane over snow-capped mountains (Scott C2).